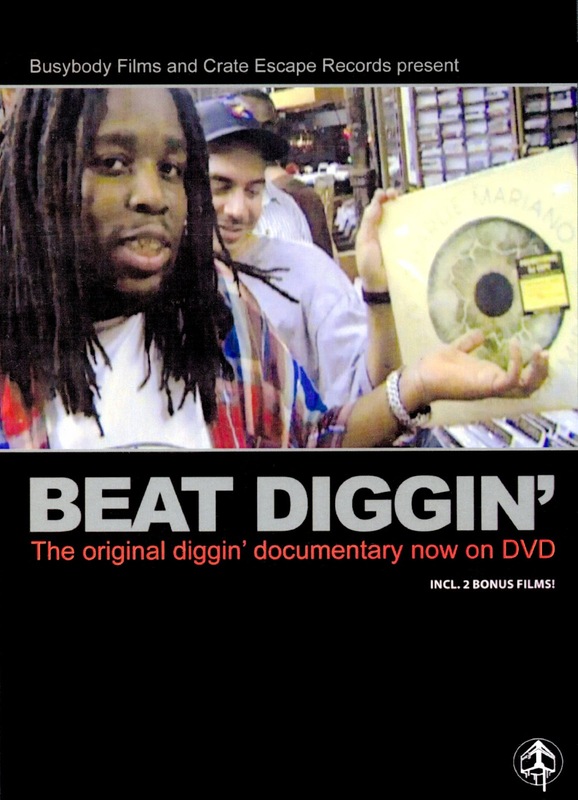 A couple years ago, I reviewed the original hip-hop documentary about hip-hop production from a crate diggers' angle, Beat Diggin'. Well, I'm reviewing it again. Why? Because it's finally been released on DVD (for the first time ever, even though it was made back in '98). And what's more, it's an all new, substantially different version of the film. In my initial review, I bemoaned the fact that there was no legit, "purchasable option;" Beat Diggin' was only available to be seen via crappy online streaming and dodgy downloads. So I'm very happy now that it's finally got a proper release. And before I get into the "new version" here, let me address some of you skeptics out there as a fellow purist. The original version of the film is on here, too. So, how do the two versions differ? Well, again, for my basic review of the film, I'll refer you to my first post on the subject. But I should point out that the version I reviewed was actually neither version here. In fact, my biggest criticism of the film - that the performance footage in the middle really seems out of place - applied only to that weird, online version. Both of the versions here are much tighter watches. The original is 22 minutes of just the diggin' and production talk. And the new version expands on that, adding an additional 12. The more superficial changes include new, English credits (the original were in Danish, because while this was filmed in NY, interviewing all NY producers, the director is actually from Denmark). So there's that, new music and interstitial shots that give the film a more polished, professional feel. It's also been upgraded to stereo sound and re-framed/cropped for widescreen. That last one's the only potentially controversial alteration, but again, remember purists, the original version is on here, too. So those are the little things. The big thing is the sizable chunk of new (shot at the time, but unseen 'till now) interview footage. None of this new stuff feels superfluous or tacked on. The film's been re-edited to incorporate the additional material, which is all strong. It's cool having the original here, but it winds up becoming more of an artifact, because the new version not only improves on, but essentially replaces, the original. Then this DVD also includes two of director Jesper Jensen's other films: Beats, Rhymes and Videotape (shot from 1994-2001, but only completed in 2009) and 2003's Who's Next? To be honest, Beats feels like the weakest of the films... almost more a collection of footage than a film with focus and drive. But it's dope footage, so it's still a real treat to have. There's interviews with acts like Gangstarr, The Pharcyde,.. Master Ace in particular kicks a really awesome freestyle. Then Who's Next? feels more like another, proper film, with more on the MCing side (rather than Beat Diggin's production), looking at up and coming, underground NY hip-hop acts of the time (now ten years ago). This one's notably longer than the others (54 minutes), with a good mix of interview and performance coverage. There's a lot of great freestyling on-hand (Rise impressed me in particular), and what's great is that we get a nice in-depth look at a lot of dope artsists who we otherwise don't see nearly enough of, like Ge-Ology, Juggaknots Poison Pen, and J-Live. So, Beat Diggin' is really the most important film here, but the whole thing adds up to a really nice package. And while this was shot on the pure, indie low budget tip years ago, so you can't expect the image quality to rival your Avatar Blu-Rays, I have to say it looks noticeably better than the stream I watched two years ago. This disc is order-able direct from Crate Escape Records - the same label that brought us Kurious's demo four years ago. It's Region free (R0), but US heads should be aware that it is PAL, not NTSC, so you might have to watch this one on your computer. And it's limited to 200 hand-numbered copies, so don't wait too long. And if you're a fan of this film, stay tuned... I've got a special treat coming right up for you guys - an exclusive interview with the director himself!